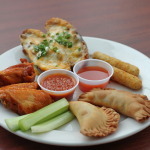 Come by for lunch or dinner and sample all your old pub favorites in our restaurant: juicy burgers, zippy wings, freshly made soup, disco fries, potato skins, spicy nachos, thin crust pizza with all the toppings, gluten-free pizza available, salads and fat sandwiches. Don’t forget dessert: Ice cream, tasty cakes/pies…Or step it up a notch with a killer entree of steak, seafood, chicken parm, or one of the daily chef’s specials from the kitchen. 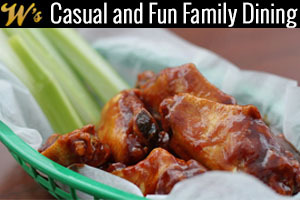 Families with children are welcome in our spacious dining room, bring the kids and their friends! We have a kids menu with all the basics to please the most picky eaters. Mac & Cheese, Chicken fingers, fries and Ice cream! Ice Cream! We all scream for Ice Cream! Bring the whole team in for monster burgers & pizza with pepperoni and sausage after a big win at Indian Hills or the oakland recreation fields! We are near the oakland recreation fields and valley middle school, about 1/2 mile away on Elm St across from the KFC. Oakland Rec coaches can have a beer at the bar and discuss whether to go with a zone defense or man-to-man. We take great pride in delivering top quality food at reasonable prices to our customers. Our kitchen, restaurant dining areas and bathrooms are spotless which is extremely important in a quality restaurant. All of our food is purchased daily and prepared fresh, not like the diner! This is no diner! Don’t feel like cooking tonight or going out for dinner? Do a quick drive by and pick up some tasty pizza or burgers! Click to call us for takeout. If you have enjoyed awesome service and food at W’s Grill, we would love to get your review online. Your reviews tell the world about our excellent food and atmosphere, and help grow our business! Follow links below to leave a review of our restaurant. Click here to leave us a restaurant, pizza, catering, private party or sports bar review on Google. Click here to leave us a restaurant, pizza, catering, private party or sports bar review on Yelp. Check out videos from the bar on our YouTube channel. Sports are a staple at W’s, there’s always a game on somewhere. 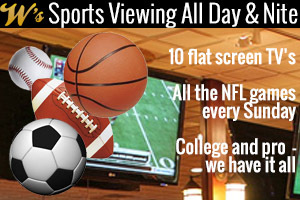 We have 10 flat screen TV’s and will setup the sports game of your choice on any of our screens – just ask the bartender or hostess to fix you up. NFL & Super Bowl Sundays are rocking with drink and food specials all day long. We have a loyal crew of Jets, Giants, Yankees & Mets fans at your disposal to enjoy the game with. Fans of all teams are always welcome, even long suffering Raiders fans..
On tap we have a nice selection of beers: Guinness, Bud Light, Sam Adams, Blue Moon, Stella, Yuengling, IPA. Plus many many different bottled beers and a full bar with premium liquor selections. Check out some cool pictures of the bar here. We also offer food & drink specials Sunday-Thursday. Definitely stop in and take advantage of the ridiculously low prices and quality food/drinks! Monday: $3 Domestic, $4 Imported Beer during the football game. Happy Hour runs Monday-Saturday 4-6pm with a $1 dollar off all drinks, beer and wine. Where else can you get happy hour prices on a Saturday???? 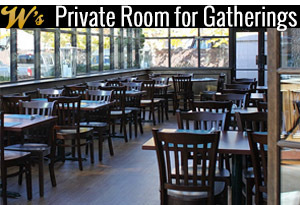 We can host your private event in our atrium room. The atrium room is perfect for a bridal shower, birthday party, reunion, corporate meeting or happy hour, business networking event or club/team meeting. We can accommodate about 50 people in the atrium room and plenty more could spill over to the bar area. Call us at 201-651-0005 to discuss your event needs. Check out our catering page if you want W’s to do the cooking while you enjoy your party. Our specialty is corporate events, weddings or private parties. We can customize the menu if you have a special request. We also fire up the barby in the summer, always guaranteed to be a good time! Call us at 201-651-0005 to discuss your event catering needs. Towns that we will bring our traveling catering service to include: Suffern, Nanuet, Ramsey, Mahwah, Wayne, Montvale, Saddle River, Allendale, Ridgewood, Parsippany. We cover most of Bergen, Passaic and Rockland Counties. W’s supports several local organizations in Oakland such as: Oakland recreation program, Oakland Men’s Softball League, Valley Middle School, Indian Hills high school varsity teams, Oakland Fathers Club, Knights of Columbus. Come in to the restaurant for some tasty food or a drink and return some of that Oakland community spirit! Pay it forward! We are open 7 days a week for lunch and dinner and the jammin’ sports bar stays open late on Thursday, Friday & Saturday nights. Our kitchen cranks out pizza, gluten-free pizza also available. We are located at 20 Elm St in Oakland – right off 287 & 202 (Ramapo Valley Road). About 1/2 mile from the oakland recreation complex , a short walk from valley middle school and Indian Hills high school. We are located in the same complex with Oakland Hardware & Spotted Dog Day Care. Just a short drive from Suffern, Mahwah, Pompton Lakes, Franklin Lakes, Wyckoff and Wayne! 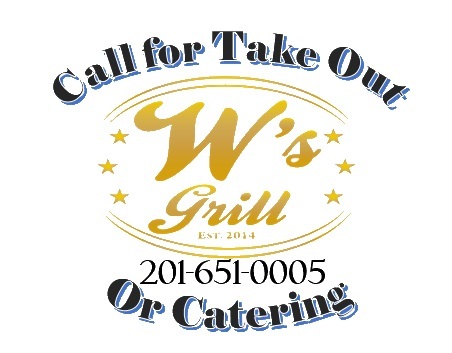 Come hungry and thristy to W’s Grill Restaurant and Sports Bar – Bergen County’s Finest!